Journal : Medical and surgical reports of the City Hospital, Boston ; series 3. Boston : Rockwell & Churchill, 1882. Description : 340-353, [2 l. pl.] ; ill.: 2 photo. leafs, 11 in-text engrs. ; 23 cm. Photographs : 2 heliotype leafs with 4 and 5 images of orthopædic apparati. Photographer : William Palmer Bolles (attributed by the Cabinet of Art and Medicine). Subject : Long bones — Fractures ; Splints. Author caption: BY WILLIAM P. BOLLES, M.D. Instructor of materia medica, Harvard, 1880-1884. Visiting surgeon to out-patients, Boston City Hospital, 1885-08. 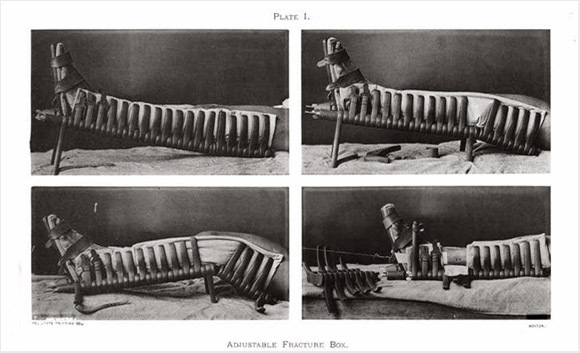 Photo caption: PLATE I. ; ADJUSTABLE FRACTURE BOX. ; Heliotype Printing Co, Boston. Photo caption: PLATE II. ; HAM SPLINT. INVALID TABLE. ; Heliotype Printing Co, Boston. Volume inscribed by Geo[rge] B[rune] Shattuck (1844-1923). Index Medicus: 20801911190, 20205271120 (offprint). But Bolles was not only a doctor. He was a natural craftsman, self-taught, in many directions. 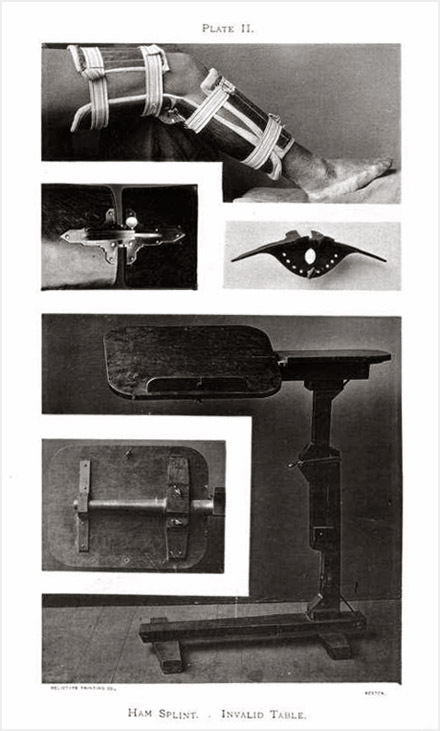 He had a work-shop with the best tools and apparatus. There, long before breakfast, he was happily at work. When I began practice, I received a gift of his carved splints of many kinds, of original and excellent device, such as could not be bought; finger and thumb-splints. too, of brass. One day he showed me a set of instruments of precision in minutest weighing and measuring, his own handiwork. He melted silver and fashioned it into artistic shapes. Always a good microscopist, in his later days he bought a telescope and studied the skies with delight. His skill with pencil and paintbrush has been mentioned, but photography, in which he was a master, interested him more than art. His photographs of flowers could hardly be surpassed, and in landscape he had a good sense of composition, yet with regard to old masters and Renaissance painting, it pleased him to play the Philistine. On his first visit to Antwerp and Brussels he wrote to me of a new and unlooked-for interest he had found in the galleries–dermatological. Rubens' rich renderings of Rubéola, Scarlatina, Roseola, et id omne genus, in goddesses, nymphs and warriors, he revelled in, in a highly amusing letter.—Obituary of William Palmer Bolles, by Edward Waldo Emerson, M. D., (BMSJ vol. clxxvi, pp. 362-363). The above lines are from Dr. Bolles's obituary which was written by Dr. Edward Waldo Emerson (1844-1930), the youngest son of Ralph Waldo Emerson and published in the Boston Medical Surgical Journal (vol. clxxvi, 1917). From what Dr. Emerson reveals about the photographic skills of his friend, there can be little doubt that the excellent images illustrating this paper were created by Dr. Bolles himself. In the 1897 Reports he published two more of his inventions with a paper titled, Some new aseptic apparatus (Boston, Rockwell & Chruchill, series 8, pp. 311-325).